Door:•5½” thick door constructed of outer and inner steel plates enclosing a high density proprietary composite material. •Two hour, 350°F factory fire rating. Tested at temperatures up to 1850°F. Body:•3¼” thick body constructed of inner and outer steel plates enclosing a high density proprietary composite material. •Door and inner jamb surrounded by thick solid steel bars. Locking Mechanism:•U.L. listed Group II key changeable lock, with relock and 1 million possible combinations. •Single auxiliary spring-loaded relocking device, activated by a punching attack. •Locks and relocks protected by a large proprietary drill shattering composite hardplate. •A handle activated locking mechanism consisting of three to five 1″ diameter chromed steel locking bolts. •Five boltwork sizes allow AMSEC to build units from 12″ to 82″ high, widths from 18″ to 48″ (interior dimensions). •Bolt tensioner keeps locking bolts retracted in the open position. •Handle designed to shear in case of forced entry attempt. •Solid steel dead bars prevent door removal if hinges are removed during a forced entry attempt. •Compact locking mechanism allows for optional door mounted coin racks. Hinges:•Ball bearing hinges fabricated from high strength steel. •Precision machined alloy dowel pins. •Oil impregnated bronze bearing assures easy opening doors and reduced maintenance. •Available in Satin Black, Blue Gray, Parchment or the standard Gray textured finish. Top Deposit / Storage Compartment•Outer door equipped with a U.L. listed Group II combination lock and chrome plated front read dial. •Large storage capacity: accommodates up to nine cash register trays. •Large 3″ x 18″ deposit chute is protected by an “anti-fish”, saw-tooth, hinged baffle. •Door mounted four-opening rolled coin storage rack. Bottom Receiving Compartment •Outer door equipped with a U.L. listed Group II combination lock, chrome plated front read dial and an auxiliary key-op lock for dual control or armored car pick up. Finish:•Available in Satin Black, Blue Gray, Parchment or the standard Gray textured finish. Options:•Electronic locks, Group 1 and 1R locks. 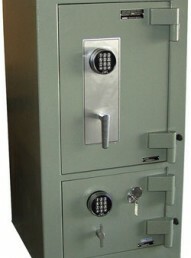 •Dual combination locks (Receiving compartment only). •Interior lockers, Interior drawers, Adjustable shelves. •Custom sizes/designs quoted upon request.